A new report heading to the TransLink Mayor's Council recommends choosing the SkyTrain over light rail and a combination of the two transit systems. It suggests the tunnelled SkyTrain route from East Vancouver to UBC is the best option to meet travel demands and a future-proof system for the next five decades. The SkyTrain from Arbutus to UBC would take roughly 10 minutes and could support 118,800 daily boardings in 2045, reads the report. However, the price tag on the new RRT scenario is at least three billion dollars, making it the most expensive of the three options. The combination option was estimated at $400 million cheaper than the SkyTrain-only route. McElhanney’s report does suggest that an elevated SkyTrain rail west of Blanca Street to UBC would be more than a third less expensive than tunnelling underground to the Point Grey campus. In June 2014, the Mayor’s Council decided the Broadway Subway Project - an underground route below Broadway Street in Vancouver – would be the best option to improve transit and lessen congestion to the university. The report claims over 10,000 daily passenger boardings are expected at UBC during the peak of the morning rush, more than any other SkyTrain station currently handles across Metro Vancouver. Should public transit be free for minors? 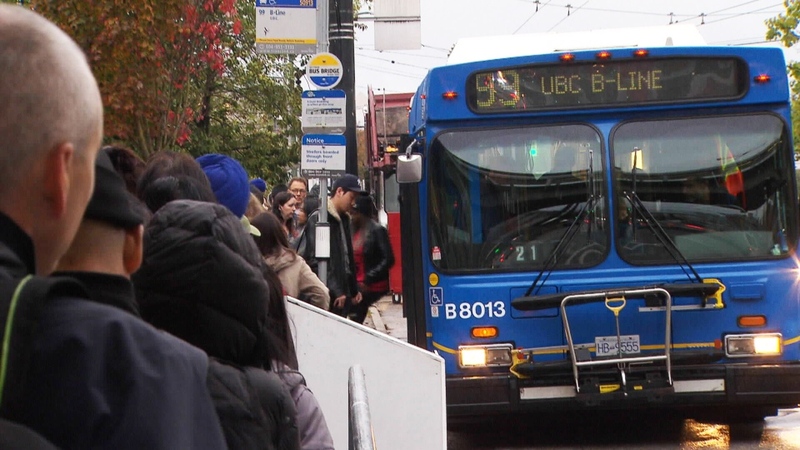 TransLink has put so many buses on the 99 B-Line route already it says the road itself is at capacity. A bus comes every three minutes.